A quick, weeknight way to enjoy comfort food with slow cooked flavor. Excellent with mashed or roasted potatoes. Combine beef, onion, cracker crumbs, Worcestershire and egg in a large bowl. Mix well. Shape meat into 6 rectangular mini meatloaves, each about the size of a deck of cards (3-1/2 x 2-1/2 x 1/2-inch thick). 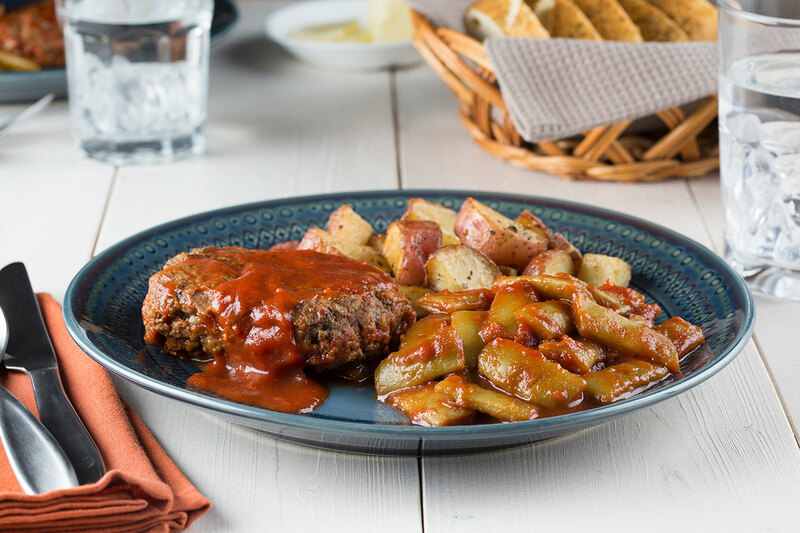 Heat oil in a wide skillet over medium-high heat; brown meatloaves 3 to 4 minutes per side. Remove meatloaves from pan and set aside. Drain fat from pan. Add sauce and brown sugar to pan. Bring to a boil; stir in green beans. Simmer over medium heat 3 minutes, stirring frequently, until slightly reduced. Return meatloaves to pan and spoon sauce over tops. Simmer over medium heat, uncovered, 5 to 7 minutes or until cooked through. NOTE: Recipe can be prepared using your favorite meatloaf recipe; shape and cook as directed above.